Written for visual arts and design teachers who teach their students e-portfolio curation. 'Young black women curate visual arts e-portfolios: negotiating digital disciplined identities, infrastructural inequality and public visibility' was recently accepted subject to changes for a special issue of the Learning Media and Technology journal. Contributions whose perspectives challenge 'universal technological solutionism' were invited for the forthcoming 'Global technologies, Local Practices: redefining digital education with marginalised voices'. "Lesley Ann", "Melissa" and "Dina" all chose not to use their full first and last names for minimising risks of sexual harassment. Such measures were often not sufficient, since their full names were shown in their email addresses. E-portfolio curricula must guide students appropriately on how to protect their privacy by not sharing genuine identities. For example, a curriculum could include reflection of the potential negative consequence of presenting one's legal identity online, versus assuming that using one's genuine identity and legal name, as "the ('Modern gallery') artist" must be the norm. Alternative self-presentation strategies should be taught, particularly where vulnerable individuals would benefit from privacy protection. Taken together, the case studies suggested a broader need for a more inclusive visual arts syllabus. South African visual arts pedagogy largely ignores the many and varied types of genres in visual culture that students may participate in. Despite affinity spaces in youth-, do-it-yourself and ethnic cultures potentially being valuable resources for young people's e-portfolio personas and projects, students reported exercising self-presentation strategies that hid participation in "unofficial", "illegitimate" genres. There was a missed pedagogical opportunity for challenging cultural exclusion and supporting greater e-portfolio differentiation by including teens' informal cultural interests. Educators could explore potential continuities between youth’s extra-mural affinities and the visual arts syllabus. This may better engage students’ interests, whilst also offering youth greater scope to share their varied personas. For example, presenting market-driven identities in creative industry proved a valued strategy for gaining economic capital amongst under-resourced students. E-portfolio curricula can also better house the existing social network and online content practices of students, which our curricular plans neglected. For example, the curriculum could accommodate students’ pre-existing digital portfolios by encouraging students to link link to theirs from within their e-portfolios. +3> Cater for students who want to be seen as 'emergent creative pros', not "students"
An online identity as an arts student can be seen as undesirable to emergent visual creatives, who prefer to portray themselves as 'creative professionals' outside school. Examples of young creatives could be added to visual arts e-portfolio curricula for such students to learn from and experiment with. My thesis revealed that students’ curation of disciplined digital identities and addition of other personas was strongly shaped by their levels of connectivity. In particular, under-resourced youth’s school and homes did not provide sufficient infrastructure for them to fully participate in e-portfolio design. The least resourced students were under-connected in lacking home internet access and having to share ownership of digital devices. Both were strong markers of class inequality. Under-connected students were at a severe disadvantage in being constrained to doing digital portfolio curation only in e-portfolio lessons. Youth with costly mobile internet access could workaround their computer lab’s slow internet speeds, but could not always work on e-portfolios at home owing to priorities related to mobile broadband costs. The 'visual arts showcase' e-portfolio curriculum was taught as a capstone showcase exhibition project. This neglected sharing information related to students’ digital infrastructures. Their e-portfolios did not list the resources that each student used, which made it very difficult to compare the respective infrastructures youth used in e-portfolio curation. Teenagers from black, working class homes faced the greatest obstacles in accessing and using digital infrastructures. A danger lies in the increasing use of digital portfolios potentially serving as a new hurdle for these youth in accessing tertiary studies at elite institutions. This is allied to the rise of professional, digital self-presentation in spaces of creative production potentially serving as another gatekeeper to freelance projects. E-portfolio teaching must accommodate the media ecologies of students who are under-connected to the internet. They should be identified and prioritised with classroom support, since other students can readily do such work at home. Our syllabi also neglected mobile technologies by focusing on desktop and laptop computer users. Resourceful teens used their mobile phones in class to continue e-portfolio curation and overcome school infrastructure constraints. Teaching should accommodate the mobile devices that students bring with them. Students must be encouraged to use these tools for creative production, as well as to make resourceful workarounds where there are problems with classroom infrastructure. I trust these five suggestions will help teachers of visual creative e-portfolios to better accommodate young people’s different circumstances, repertoires and creative aspirations. A cautionary tale for researchers using legacy Refworks and importing citations via Google Scholar (hint: it's not a "shortcut"). The Academic Referencing Horror Story- a neglected genre? There seems to be a dearth of blogposts that share academic referencing disasters in detail. This should not be surprising, since all the role-players in such dramas have little to gain from sharing their time-sucking examples: Scholarly search engines and referencing software conceal their flaws within legalese and support departments. Institutions will not spotlight their limitations in offering minimal support. Academics' reputations may suffer for sharing referencing mistakes. Even students who share their frustrations and experiences publicly (i.e. via tweets) seem to lack the motivation for elaborating these into lengthier narratives (e.g. a twitter roll). Further, since the costs are paid by the "free time" and suffering of individuals, there seems to be "no need" for systemic interventions that might address the attendant losses of scholars' time and morale. On the flipside, students and researchers who lack examples of what to avoid MUST be widely repeating the errors of their peers, surely? This may range from colleagues within a particular university to software users globally whose experiences of a service's functionality differs from its promises. Just, maybe, the downside of sharing academic referencing horror stories SHOULD not trump the importance of providing important learnings for online audiences?! In the spirit of being transparent about such disasters for others to avoid similar suffering, here's 'My Cursed Referencing'. It compiles key incidents with a cast of fellow researchers, an Apple laptop running Microsoft Word 2010, Google Scholar, Refworks Legacy and ProQuest versions plus support, the University of Cape Town, plus yours-victim-truly. If Google Scholar valued 'Don't Be Evil', its 'import reference' function would be labelled 'import an (in)complete reference' as a fair warning. A bibliography made up of such exports for recent journal articles may well be accurate and complete. BUT should your sources range across old books, scholarly dissertations and online sources, be vigilant. Your citations are probably incomplete AND imported in the wrong format (i.e. a 'book section' can be indexed as a 'journal article' by default). This was horrific, because of the time it must take to correct. I was preparing my thesis for submission in early February and could ill afford prioritising additional work. My legacy Refworks database had around 1,600 references in it. If I used 1,200 of those in my thesis and 1,000 required correction with six minutes for finding the missing information, I would need to find 100 hours to fix this giant mistake. On a related note, my main supervisor flagged another major citation evil. The particular Harvard referencing style I had used (since my BAFA Hons in '94, ahem) might be flagged as 'outdated' by external reviewers. They might prefer me to use one of the other nine Harvard styles. Prof. Marion Walton recommended that I shift to the American Psychological Association, which has just one style. It's widely used in Media Studies, so would also prove useful in developing articles from my PhD. In response, I learnt this new style and restyled my in-line citations. Enter ProQuest Refworks, enter light (yellow)? Figure 1. 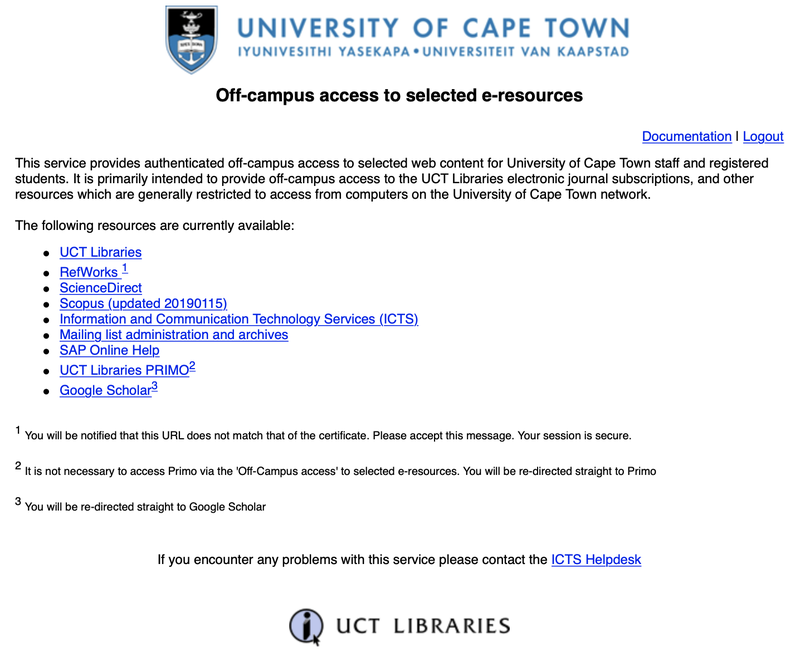 Screenshot of UCT off campus login at https://login.ezproxy.uct.ac.za/menu shows Refworks' high salience. Figure 2. 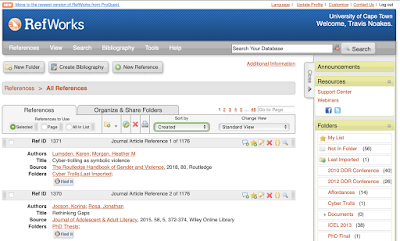 Screenshot of the Legacy Refworks screen, which shows the low salience of its top left link to ProQuest Refworks. Probably the most helpful change for my purposes was that the Legacy Refworks did not flag incomplete citations. By contrast, ProQuest Refworks did this in yellow for essential and blue for optional information. This proved helpful for Lungile Madela and I as we worked through correcting my Refworks database in one week. We had taken considerable care to ensure each reference was as complete as it could be, but some references became incomplete on export. For example, the PhD and Masters dissertations (in which we tried variations for 'Faculty' and 'Degree' under the 'thesis' type) would not display all their information under the citation view, nor in the exported bibliography. At the time, the only UCT specialist who could advise on a workaround was on leave. I did learn from ProQuest Refworks support that the university and type of degree are not mapped from the old database into the new one. So, I did a *. search for all thesis entries, then manually cut-and-pasted the correct version of each citation into my bibliography. This points again to the importance of understanding the constraints of the referencing software you use, versus what it does. Another important constraint existed in my use of an old version of Microsoft Word that did not support the use a ProQuest Refworks add-in. In particular, it automatically generates a bibliography from in-line citations. By contrast, read-through the bibliography to remove sources that had become irrelevant. I then passed my thesis through Reciteworks, a free APA and Harvard citations checker. It proved super-useful for matching in-line citations with the bibliography and also identifying stylistic errors to fix. I eventually had to update to the latest version of Word for handling my large thesis file (Word 2010 crashed repeatedly while I combined all chapters into a thesis). After submitting it, I started to use the Refworks Citation Manager for manuscripts from my thesis and the 'online academic bullies and mobs' project. This add-in worked well for me until a 'new projects' functionality upgrade was launched. Projects are a better way for organising references at a high-level; rather than showing all of them at once, one can associate a Word document with a particular project's references. I split my projects into two; one for cyberbullies, the other for my 'Inequality in Digital Personas' PhD. Figure 3. The ProQuest Refworks add-in for Microsoft Word shows old folders from my Legacy Refworks database. At last on the leading edge of referencing technology, an unexpected downside was that my'PhD' project combined with my UCT proxy access to summon the Legacy Refworks database's return. The project's old database did not reflect the new folders, citations and corrected references in my ProQuest Refworks database. Thankfully, Rich and Jay from its support portal were very helpful in organising my Legacy Refworks database's deletion. I sincerely hope that there will be no further episodes of 'My Cursed Referencing', but commit to writing a sequel post if they do... Here's to helping others avoid or overcome similar predicaments.